Lukman Haruna has put his physical problems behind him, and he could play his first Premier League game of this season tomorrow when Dynamo Kiev trade tackles with Metalurh Donetsk . The Nigeria international underwent meniscus surgery at a hospital in Monaco in August, which had kept him on the sidelines. 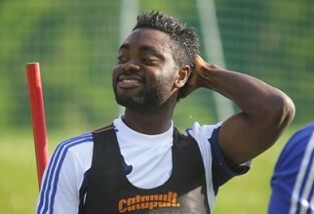 But the good news for Dynamo Kiev coach, Rebrov, is that Lukman Haruna has resumed full training with the capital side. He was one of the 24 players that participated in training on Wednesday in preparation for the match against Metalurh Donetsk. The central midfielder last donned the jersey of Dynamo Kiev in the 2 - 0 loss to Shakhtar Donetsk in the Super Cup back in July.